In January 2017, NCUWC was awarded a small grant through the Patagonia Environmental Grants Program to strengthen the Council’s efforts to bring the community and decision makers together to come up with a viable plan to remove Kellogg Dam. NCUWC has formed a steering committee with folks from Milwaukie and the community to coordinate of a community event in June 2017, a Kellogg Dam Summit in the winter of 2017, and the creation of a campaign plan by the end of the year. Stay tuned for details on upcoming events and victories as we continue to move closer to freeing Kellogg Creek! Watch the 2013 film by Straw Bale Films, Un-Dam it! The Story of Kellogg Dam. Kellogg Creek is a tributary of the Willamette River. The creek and its major tributary, Mt. Scott Creek, drain the western flanks of Mt. Scott. The 9,600-acre watershed includes private homes, commercial areas such as Clackamas Town Center, industrial areas, and roadways such as a length of I-205. This watershed also contains several large wetlands, parks, and natural areas. Due to their ecological potential, the creeks of the Kellogg Creek watershed are prioritized in local, regional, and state level recovery and resource management plans (Lower Columbia Conservation and Recovery Plan) for listed threatened salmon and steelhead who migrate through the Willamette River to spawn. By removing the dam, up to nine miles of critical salmonid habitat will be opened along Mt. Scott and Kellogg Creeks. Kellogg Creek comes to an abrupt, unnatural end at Kellogg Dam. Built in 1858 to power a flour mill owned in part by Joseph Kellogg, today, Kellogg Dam serves no purpose. The dam’s presence now only serves to inhibit fish passage. Since its founding, NCUWC has been part of a coalition of cities, agencies, community groups and private interests who have advocated for the removal of Kellogg Dam. 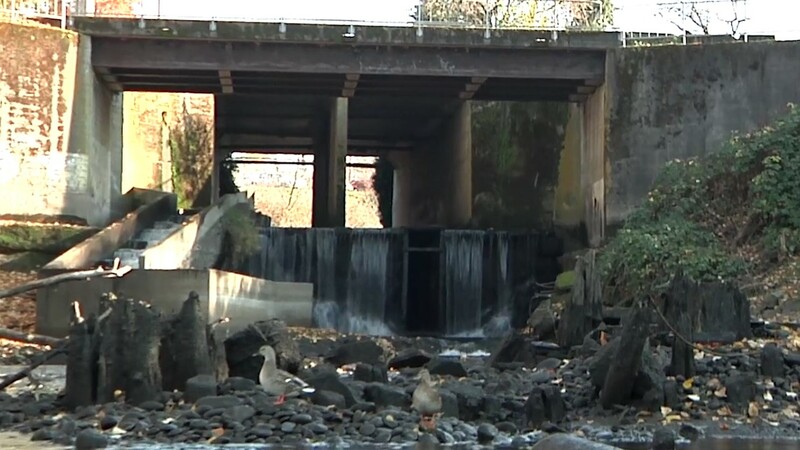 The City of Milwaukie has been the lead on the dam removal campaign through their Kellogg-for-Coho Initiative (KFCI). The KFCI was active in the Portland Harbor Natural Resource Trustee Council’s work to identify areas along the Willamette River eligible to receive mitigation funds from the Superfund Portland Harbor Cleanup. While Kellogg Dam was initially one of the three projects region-wide that were selected to receive a comprehensive Habitat Evaluation Analysis by scientists from the NOAA Restoration Center, ultimately other sites were chosen for this funding. Over the years, NCUWC and our partners have invested extensively in habitat restoration and water quality improvements along both Kellogg and Mt. Scott Creeks through our SSP and other projects. However, the next step for NCUWC, the watershed, and community is to reinvigorate the fight to free Kellogg Creek through NCUWC’s Kellogg Creek Dam Removal Campaign. NCUWC’s goal for the Kellogg Creek Dam Removal Campaign is to bring all stakeholders and the community together to collaborate on the plan for and implementation of the removal of Kellogg Dam. The techniques we will use to achieve this will be community education and organizing. Several key actions for the campaign in 2017 will be to convene a bimonthly meeting of stakeholders, hold a campaign kickoff and community event in June, and write a campaign plan by the end of 2017. Join NCUWC mailing list to get updates on the Kellogg Creek Dam Removal Campaign. Contact NCUWC at 503-550-9282 or coordinator@ncuwc.org to get more information and volunteer for the effort!